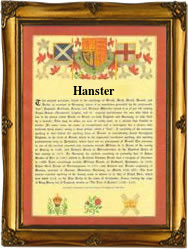 Recorded as Anster and Hanster, this is an English surname, and probably locational. If so it may well have originated from places called East & West Anstey in the county of Devon, or Ansty in Warwickshire. In all cases the place name derives from the pre 7th century Olde English word 'anstiga' meaning a narrow place or footpath, or perhaps both, as the villages are apparently on hill sides. It is also possible that an 'anster' may be a person from the Anstey's, in the same way that a Brooker lived at a place called Brook or perhaps beside a brook. What is certain is that it has been recorded in the surviving registers of the city of London from at least Elizabethan times, although it is also possible that earlier recordings remain to be found in county charter or court records. These recordings include Margrett, the daughter of John Anster, christened at St Giles Cripplegate on October 30th 1594, and two centuries later that of Jacob Hanster who married Elisabeth Cuthbert at St Martins in the Field, Westminster, on January 10th 1775.